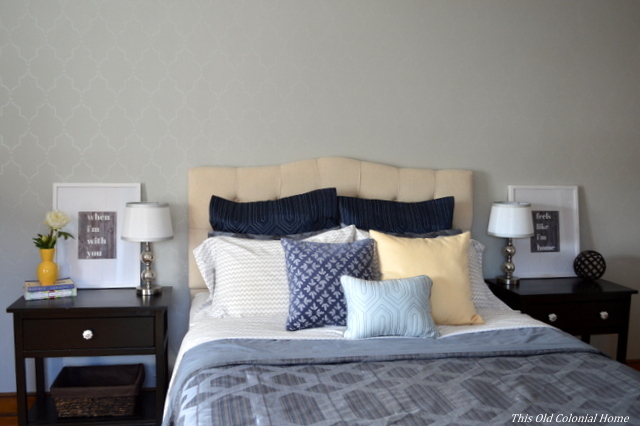 I am so happy to report that our master bedroom is finally done! It has taken more than a year to get this room all pieced together. Gasp! Certain things just tend to hold up the process: time, money, jobs, weekends away, a baby on the way … but that’s alright. This is what real life looks like (at least for us). Who are these people anyway who can knock out a room in a weekend?! 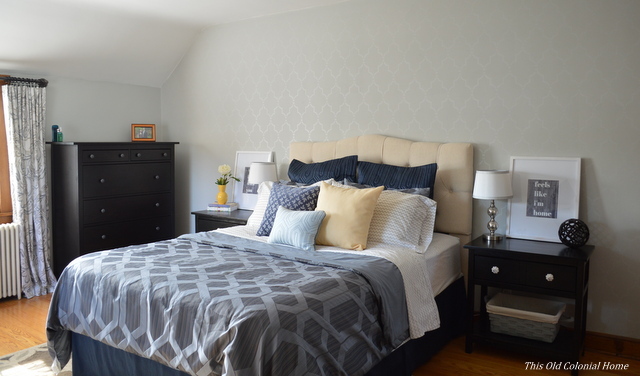 It all started in March of last year when Jamie painted our room Cliffside Gray by Benjamin Moore and I tackled my first stencil wall. (See all the details here.) 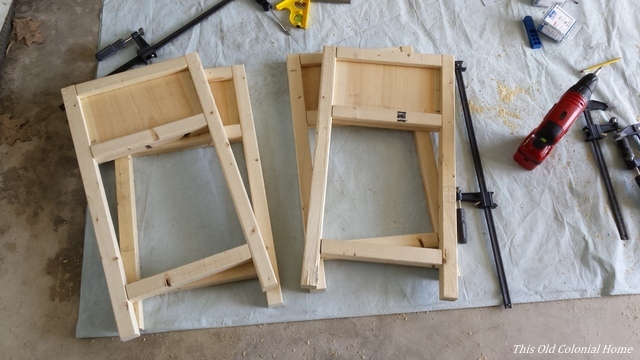 The furniture remained a hodgepodge of pieces that didn’t go together. 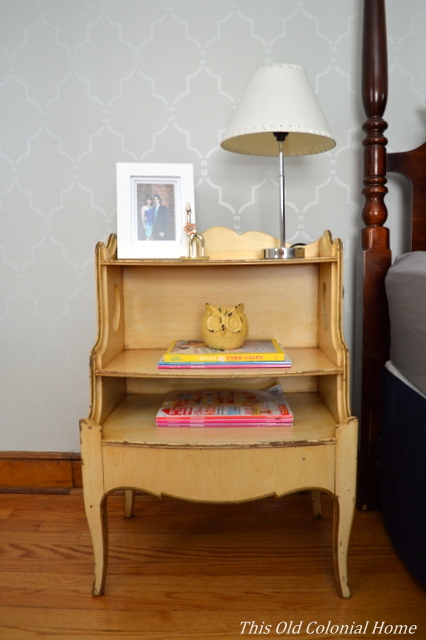 I had bought a yellow nightstand at a garage sale for $5 that I loved. The original thought was to add another yellow nightstand on the other side of the bed, but as usual I eventually changed my mind. So the room remained in a state of mismatchedness. (Is that even a real word?!) The plan now is to put this pretty little piece in the nursery. 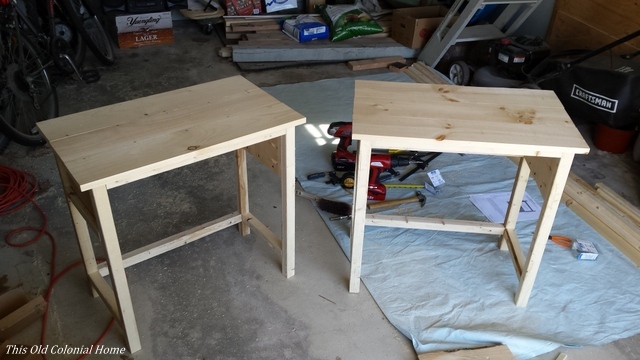 Over this past winter, the furniture started to come together a little bit better. 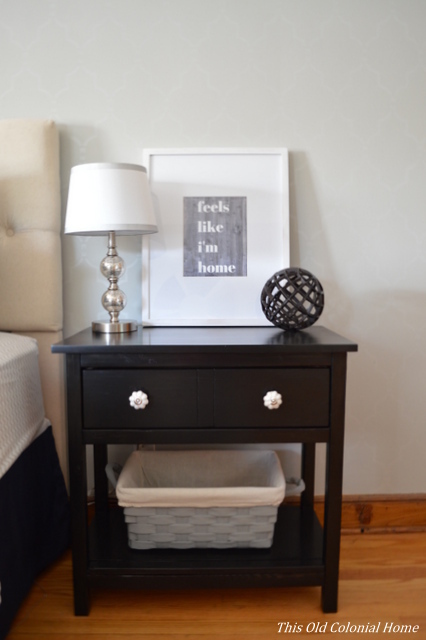 We bought dressers from Ikea and started adding some decor. 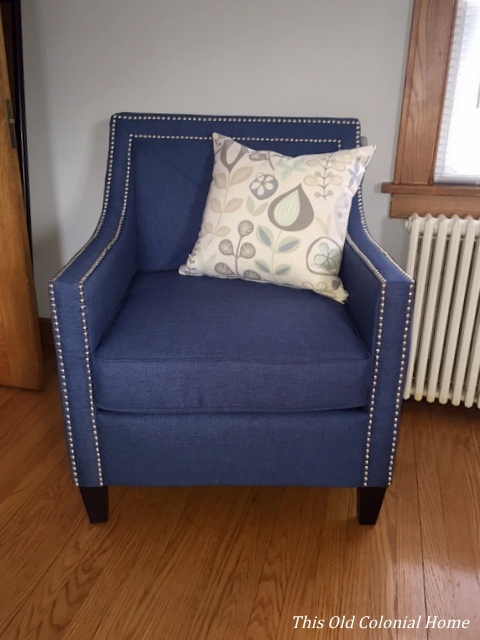 I then splurged on this accent chair from Marshalls. We had the space for it, and it was just too cute to pass up! We also added curtains with some industrial pipe rods (see it here). 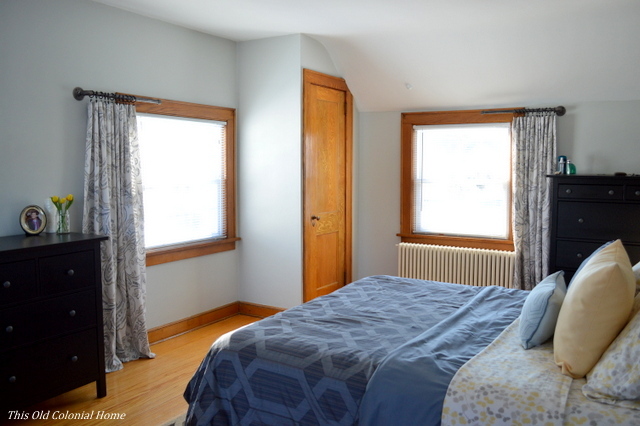 It’s amazing how curtains can make a room look so much more complete! At this point I wasn’t feeling our headboard anymore. I just didn’t like the color of the wood with the new dressers. So onto Craigslist it went and the search began for a tufted one. 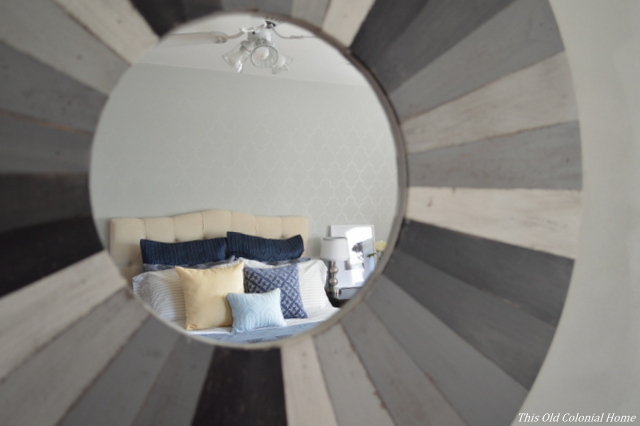 After a few months, I found the perfect headboard on Wayfair for a crazy, awesome price! (This is not a sponsored post, but I’m telling you, you should sign up for those daily deal emails. They will literally pay off!) And after just a few days of ordering it, our headboard finally sold too. It was meant to be! 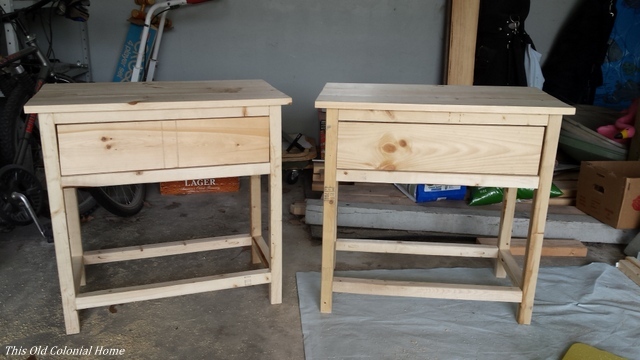 So now we’re down to the final pieces of the puzzle: the nightstands. 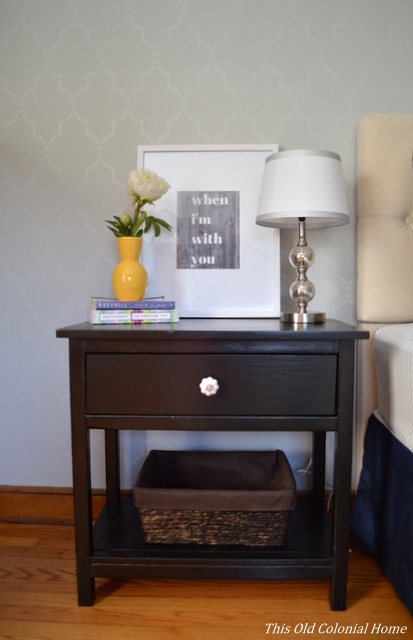 My ever-so-handy husband built us two nightstands using these free plans from ana-white.com. 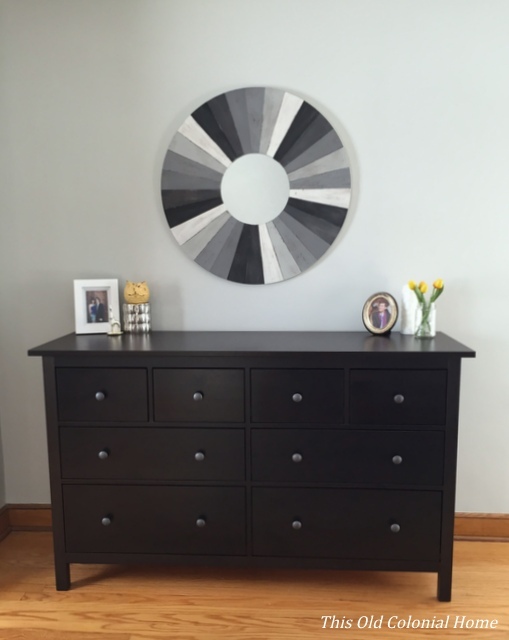 Here are a few shots of his work in progress: I was then tasked with finding drawer pulls, lamps, and decor. Again, each item took a little bit of searching, but it finally all came together. My favorite part is the artwork. Instead of buying some generic saying in the store (sorry, but I’m over the ‘Love you to the moon and back’ signs), I used Canva to create something that has more meaning to us as a couple. “When I’m with you feels like I’m home” is a lyric from the Duncan Sheik song ‘Home,’ which is the first song we danced to as husband and wife! So as you can see, this room went through a lot of different phases. Here’s where we originally started when we first bought the house. And this is how it looks now! 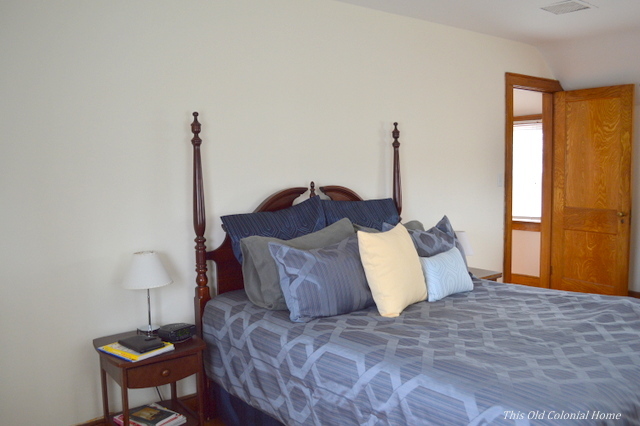 I truly love our master bedroom! I find it to be such a calming and relaxing space, and a true reflection of us. Is it time for bed yet?! 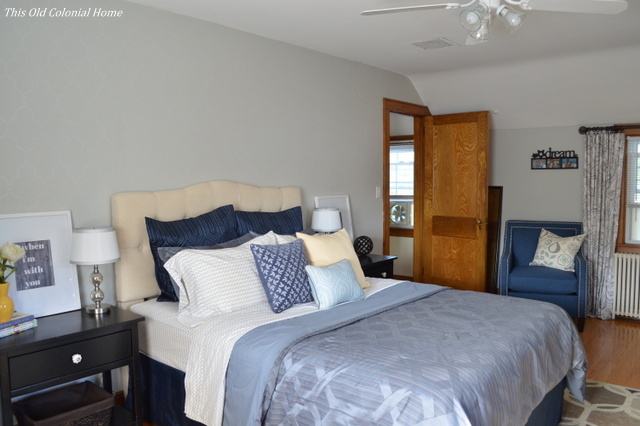 Categories: DIY, Home Decor | Tags: Benjamin Moore, curtains, diy, home decor, interior design, master bedroom, nightstands, paint, stain, stencil wall, Wayfair, wood | Permalink.